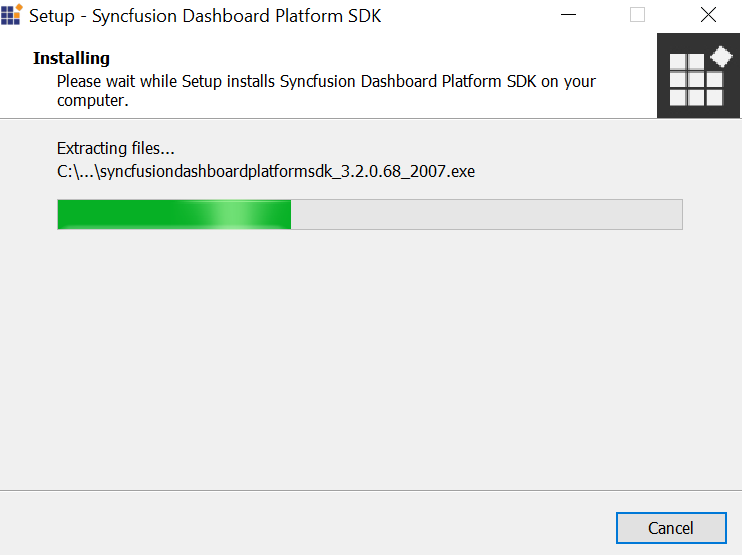 Installation and Deployment of the Syncfusion Dashboard Platform SDK. 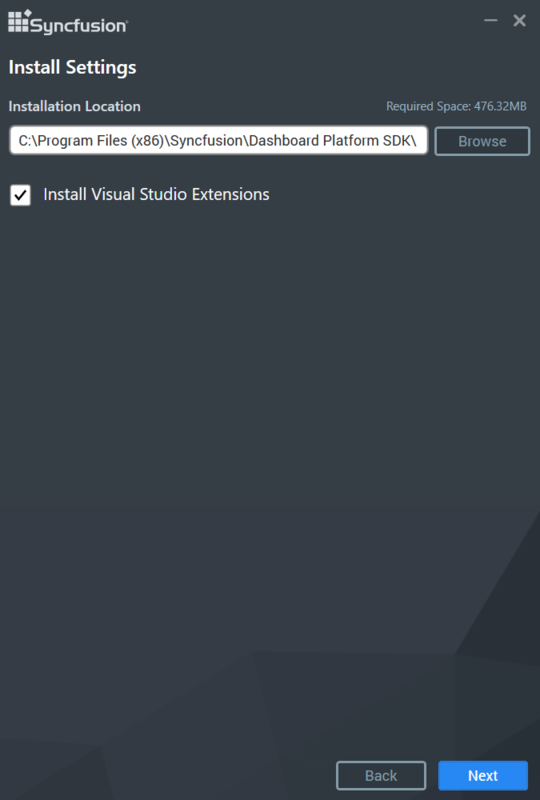 This section briefly illustrates the installation and deployment procedure of Syncfusion Dashboard Platform SDK. 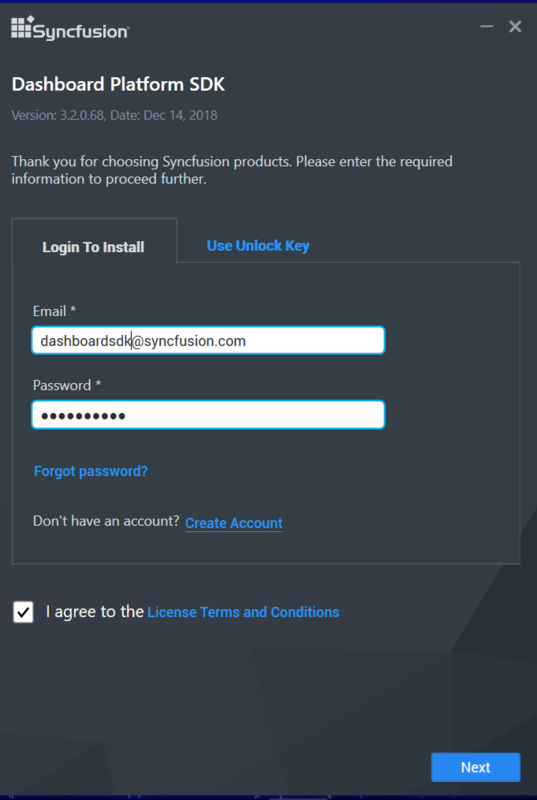 To learn about the system requirements needed to install the Syncfusion Dashboard Platform SDK in your machine, see System Requirements section. Run the saved installer either through clicking the Run button or by double-clicking the EXE file from the saved location. 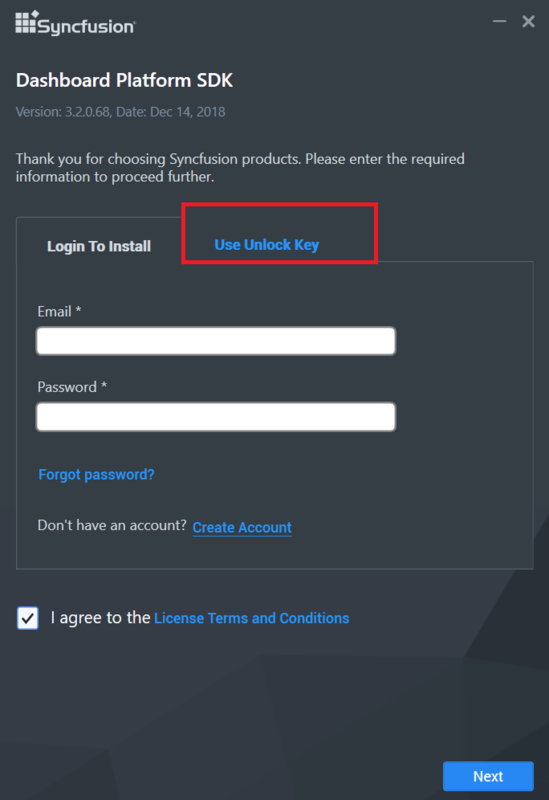 Run the Dashboard Platform SDK Installer and type in the credentials of your Syncfusion account to unlock the setup. You can alternatively type in the unlock key that has been sent to your registered e-mail address to unlock the setup by selecting the Use Unlock Key option. You can check the License Agreement of Dashboard Platform SDK by clicking on the License Terms and Conditions. Browse to the location where you would like to install the Dashboard Platform SDK application and click NEXT. Perform the additional task desktop shortcuts creation. If you want to perform the additional tasks, you can check the option. Otherwise, you can uncheck it and click NEXT. 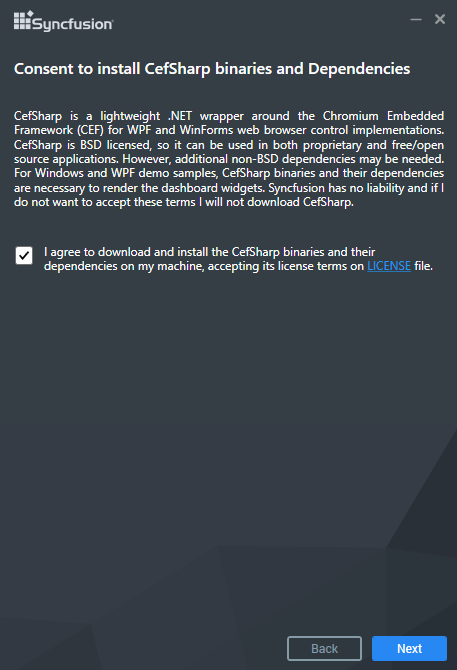 Read and accept the license terms through checking the option LICENSE for download and install CefSharp and click NEXT. If you have any problem with internet connection or do not have internet connection, unselect the PhantomJS download option and continue to install. To manually install the PhantomJS, please refer this. 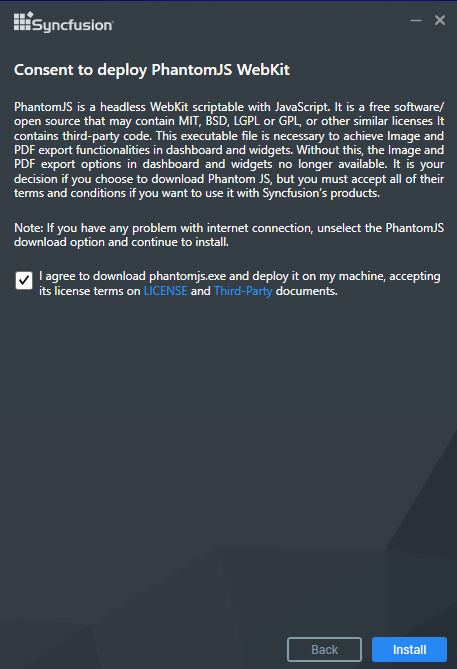 Read and accept the license and third-party terms and conditions through checking the option LICENSE and Third-party for install PhantomJS and click INSTALL. Now the installation begins. You can cancel the installation anytime through pressing CANCEL, if you prefer. On successful installation, the above screen appears. Click Finish to close the installation wizard and check any one radio button for run Sample Browser or Explore Samples. 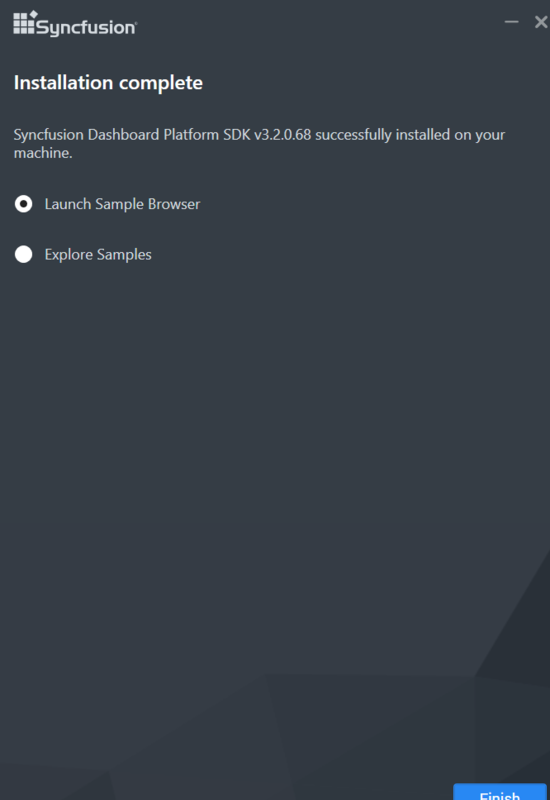 1.Double click the Syncfusion Dashboard Platform SDK setup. 2.Syncfusion Dashboard Platform SDK setup will be extracted in Temp location (%temp%). 3.Copy the extracted Dashboard Platform SDK setup to some other location and cancel the installation. 4.Open the command prompt with administrative privileges and run the extracted Dashboard Platform SDK setup with the following arguments. 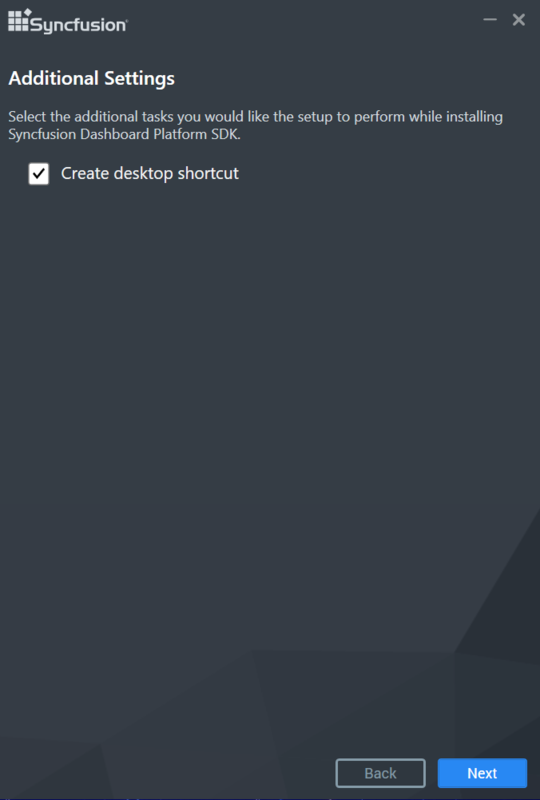 Now, Syncfusion Dashboard Platform SDK will be installed in silent mode. To download PhantomJS application and deploy it on your machine, you should accept it’s license terms on LICENSE and Third-Party document. Then, you can download PhantomJS by clicking here. Once download completed, extract the zip file and then copy the PhantomJS application from the zip extracted location and paste it in the below mentioned install locations. By installing the Syncfusion Dashboard Platform SDK, the samples are installed in the following location. The scripts, styles, and fonts that are required to run the dashboard application will be placed in the following location. This folder contains samples of different platforms such as ASP.NET, ASP.NET Core, ASP.NET MVC, Angular 1, Angular 2, TypeScript, Aurelia, LightSwitch HTML, PHP, UWP, Windows Forms, and WPF. Internet connection is required to run sample dashboards as their data need to be retrieved from a remote data server. 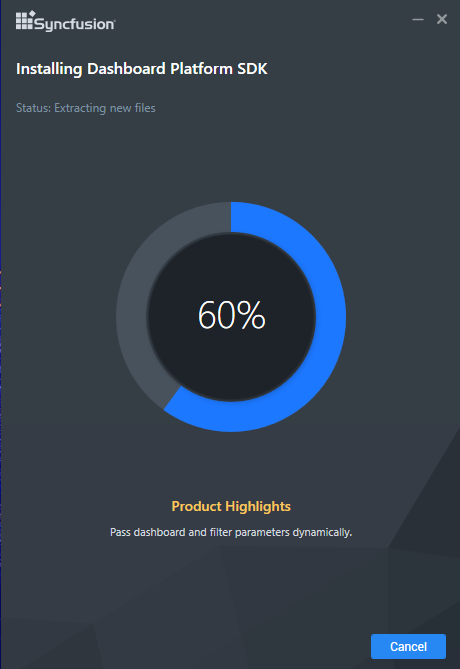 With the installation of Syncfusion Dashboard Platform SDK, a windows service called Syncfusion Dashboard Windows Service is installed and started automatically to run as a background process. This service is essential for the Dashboard Viewer to render the dashboard. You can also stop and restart the service through the Task Manager, if required. To install Dashboard Service as windows service, copy the folder Windows Service with its contents from the following location, and paste in a desired location and run the Syncfusion Dashboard Service Installer.exe. 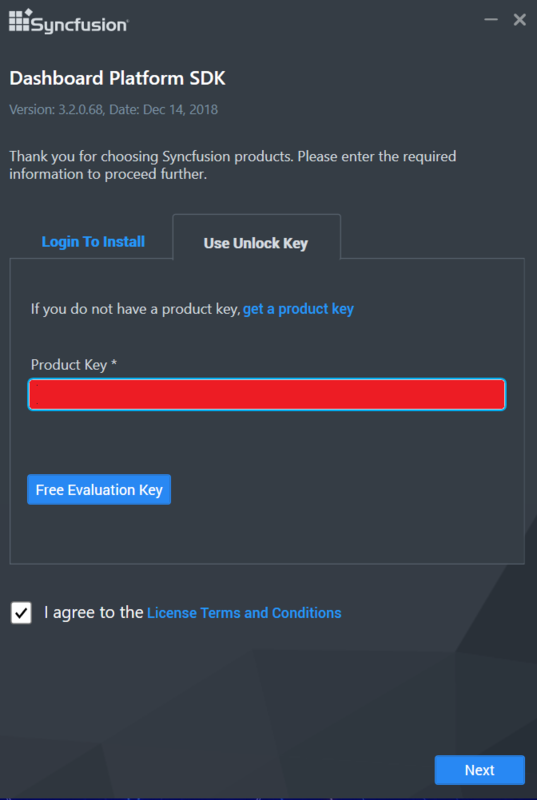 Running Syncfusion Dashboard Service Installer.exe requires administrator access for the current user. Dashboard service can be accessible only at local machine as this service is running as a Windows service background. Dashboard Service as windows service is not recommended for the production environment. Refer here to learn about how to host the Dashboard Service in IIS. You can stop/restart/uninstall the service through this EXE when you deal with any error related to service as follows. To host Syncfusion dashboard service in IIS express and run on deployment machines, copy the folders DashboardServiceInstaller and Service along with their contents from the following location, and paste in a desired location in the deployment machine and run the SyncfusionDashboardServiceInstaller-IISExpress.exe available in the DashboardServiceInstaller folder. To host Syncfusion Dashboard Service in IIS and run on deployment machines, copy over the folders DashboardServiceInstaller and Service along with their contents from the following location, and paste in a desired location in the deployment machine and run the SyncfusionDashboardServiceInstaller-IIS.exe available in the DashboardServiceInstaller folder. SyncfusionDashboardServiceInstaller-IIS.exe can be executed using command prompt to host the service in the specified port after copying the required file. SyncfusionDashboardServiceInstaller-IIS.exe execution requires administrator mode. Hosting dashboard service at IIS is recommended for the production environment for object management and other memory management features.Refer here to learn about how to host the Dashboard Service in IIS manually. To configure SSL for Dashboard Service, run the Syncfusion Dashboard Service Configuration Manager application from the following location. Choose the required type of configuration and click Save. SyncfusionDashboardServiceConfigurationManager.exe execution requires administrator mode. Restart the service in IIS Installer after configuring the SSL. The previous steps are not applicable for Window service. To configure the Bower in your machine, install node, npm and git. For more information to configure the Bower package please refer the official site for bower. Open your web project’s location in a command prompt window. Run the command Bower install . You can add the packages to the bower.json file by specifying the package name. This will install/restore the packages to your project. Refer to the following image. ASP.NET 5 (preview) projects have bower.json file by default. If your project does not have bower.json file, run the following command from your project directory by Command prompt. Run the install command by providing the package content’s location. To update the installed Bower packages, run the command Bower update .